BigOption Launches an Indicator-Based "Strategy Advisor"
Adding a new dimension to the binary options experience, BigOption has announced the utilization of several indicators in its platform with the new feature, “strategy advisor”. The feature functions on the platform’s charts, allowing traders to receive advice based on the most popular three indicators – Relative Strength Index, Moving Average and Bollinger Bands. Providing the suggestions automatically, the new feature effectively eliminates the need for traders to study and deploy the indicators by themselves, this making sense as the goal of such a tool is to create an all-in-one package for put/call options. Each of the three indicators provides signals in a different way, but the system is preset to automatically give one of the two outcomes as the more likely one. This process is meant to spare traders adding the indicators under the charts and trying to interpret the right moment to enter a position, common among forex traders. The new feature is used in a pretty straightforward manner. 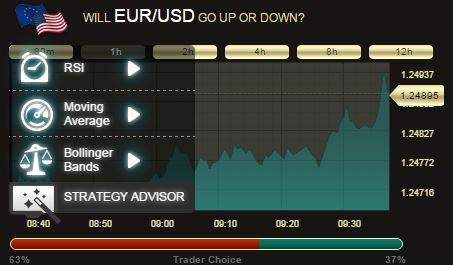 After selecting an instrument and expiry time, by hitting the Strategy Advisor button the three indicators pop up. Once the choice is made it takes 10 seconds for the analysis to be made and a suggestion for the direction of the trade is made.